Transportation companies prepare their freight quotations based on the chargeable weight of the cargo. In order to reach the chargeable weight, first of all you have to calculate the volumetric weight of the cargo. Recently I have written couple of articles in regards to chargeable weight and volumetric weight. On one of my articles, I have explained how to calculate chargeable weight in air, sea and road shipments. In another article I have answered the question whether chargeable weight and volumetric weight are the same concepts or not. Today I would like to suggest you 3 different online volumetric weight calculators all of them are totally free of charge. Tuvia Group Srl is an Italian based international freight forwarding company. According to the information they have supplied on their website, they are engaged in international air, maritime, land, multimodal shipments and integrated logistics. They could carry contracts of all types: from the single package to the most complex industrial project. Tuvia's online volumetric weight calculator is the best option, compared to other companies' tools according to my research. 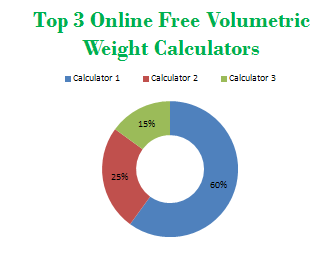 What makes their online volumetric weight calculator unique is the ability of to perform air, sea and road volumetric weight calculations at the same time. 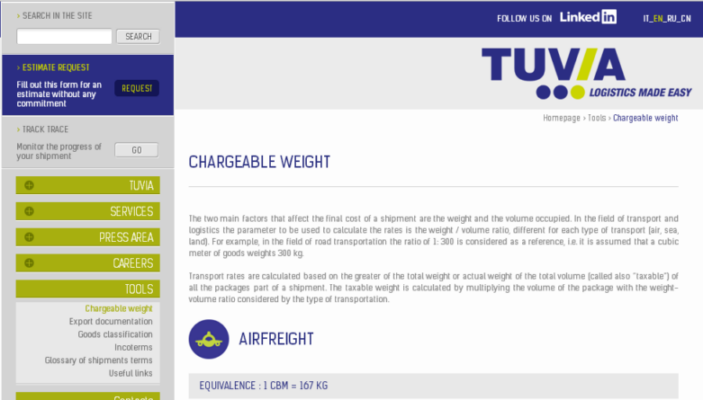 Other companies' online volumetric weight calculators only work with air shipments, but not make calculations for road or sea shipments. You can reach Tuvia online volumetric weight calculator from this link. Note from 25.December.2017: Please be informed that Tuvia Group Srl has been bought by another company and they no longer provide volumetric weight calculator in their websites. It is really unfortunate loosing such a good calculator. DHL is one of the biggest express courier service company in the world. DHL also offers sea, air, land and multimodal logistics solutions. 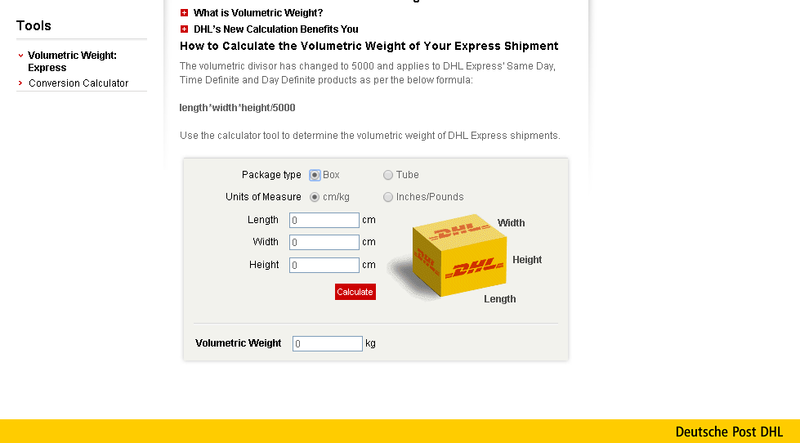 DHL's volumetric weight calculator can be used only with air shipments. It is worth mentioning that DHL uses a slightly different volumetric weight constant in its calculations. In general air transport companies use air shipment volumetric weight constant as 167 kgs / cbm, but DHL uses it as 200 kgs / cbm. Below you can find DHL announcement in regards to updated volumetric calculation. Previously the volumetric divisor was 6000, not 5000. You can reach DHL online volumetric weight calculator from this link. Fedex is offers similar services to DHL. Fedex invented express distribution and is the industry’s global leader, providing rapid, reliable, time-definite delivery to more than 220 countries and territories, connecting markets that comprise more than 90 percent of the world’s gross domestic product within one to three business days. 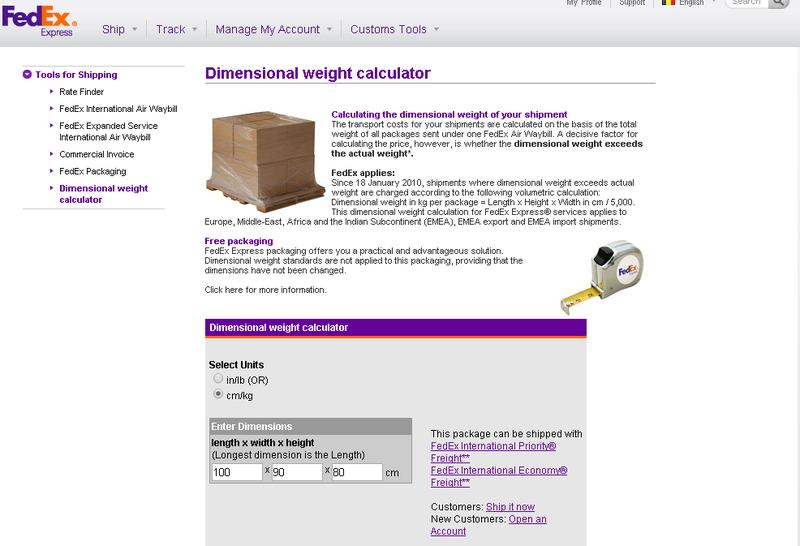 Fedex's volumetric weight calculator can be used only with air shipments. You can reach DHL online volumetric weight calculator from this link.